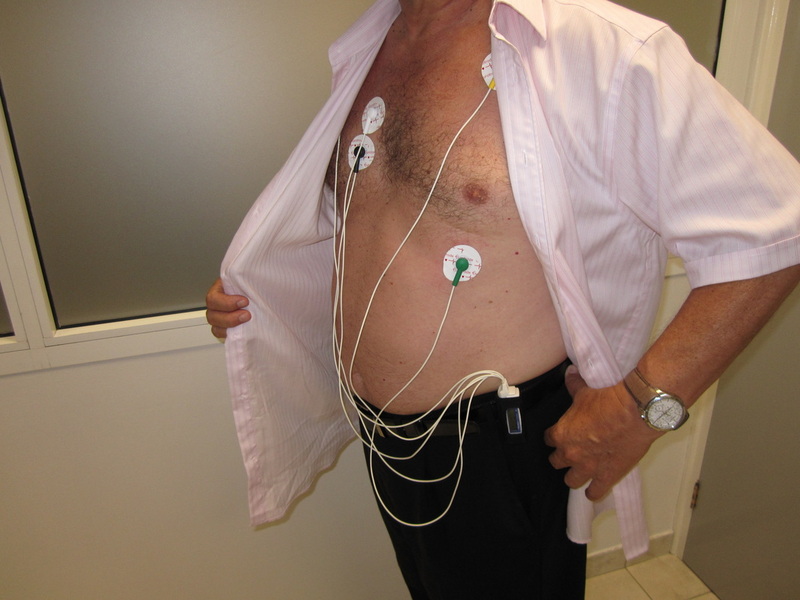 The patient is connected to the holter system with a small recorder attached to the belt. 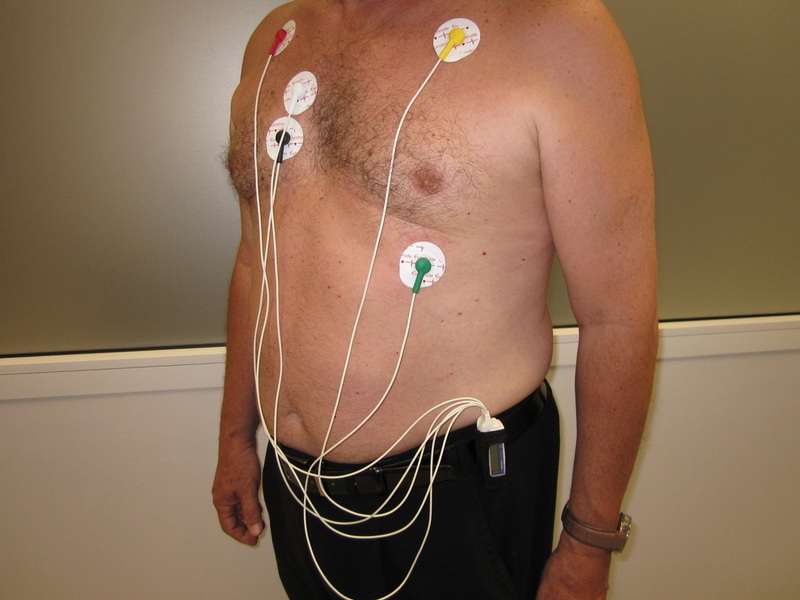 A Holter monitor test provides the doctor with the same information as an ECG, but over a much longer period of time. The doctor may need this information because you are having intermittent symptoms of palpitations or breathlessness, or he may need to know how your heart responds to certain medications over the course of the day. In this case, a Holter monitor can be fitted to record the necessary information. If you and your doctor have decided that you need to have a Holter monitor test you will be shown to the area where the monitor will be fitted. You may be asked to remove your shirt or blouse, but sometimes it is possible that lifting up your shirt or unbuttoning it is sufficient. The doctor will select certain areas on your skin that are suitable for the ECG electrodes, and will then wipe the area with a cleansing wipe to remove any cream or oil to ensure that the special electrodes will remain in place. A small recorder will then be attached to the skin electrodes with a series of wires. This recorder has been programmed to record the electrical activity of your heart for a pre agreed period of time, usually 24 hours, but sometimes this may be longer. You will not feel any pain or discomfort throughout the test. You will then be asked to return home with the monitor, and return it at a time that you have agreed with your doctor. Are there any special instructions whilst I am at home? Once you return home it is important that you carry on with your normal daily activities. It is however important that you do not take a bath or shower during the time you are wearing the monitor. It is very important that you do not get the monitor wet otherwise your results will not be recorded. If you have told the doctor that you are having symptoms we will provide you with a daily diary as it will be very important for us to know if you are having your symptoms whilst you are wearing the monitor. At the agreed time, you can return to the clinic to return the monitor. You can either have it removed by the staff at the clinic, or you can remove it from your skin at home and simply bring it to us. If you do this, somebody else could return the monitor for you. If we have given you a diary, try not to forget it! Your symptoms are very important to us. The recording will then be analysed, and your doctor will call you on the telephone as soon as possible to give you the results.